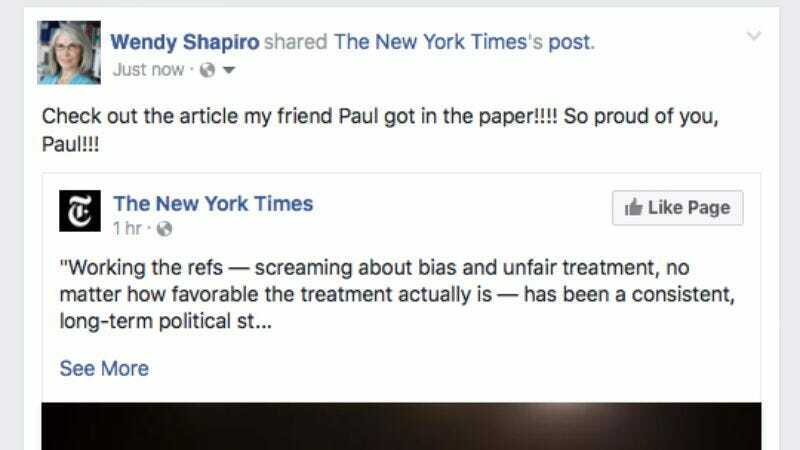 NEW YORK—Sharing the link on their news feeds with captions such as “You have to read this!” and “Check out what a buddy of mine wrote,” Paul Krugman’s Facebook friends reportedly spent Tuesday morning excitedly posting about a new article of his that was published in The New York Times. “Hey everyone, my incredibly talented friend Paul Krugman got an article in the paper! So proud!” wrote the economist’s friend Wendy Shapiro, concluding her post with several exclamation points and a series of clapping hands and smiley face emojis. “This is so, so amazing! And in the New York Times, no less! WAY TO GO, PAUL!” At press time, sources confirmed that none of the 73 people who shared the link had bothered to read the article.